This page is about carriage as a wheeled vehicle for people. For other uses, see Carriage (disambiguation). 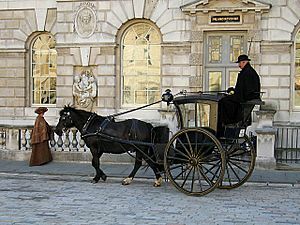 A carriage is a wheeled vehicle for people, usually horse-drawn; litters (palanquins) and sedan chairs are excluded, since they are wheelless vehicles. The carriage is especially designed for private passenger use, though some are also used to transport goods. A public passenger vehicle would not usually be called a carriage – terms for such include stagecoach, charabanc and omnibus. It may be light, smart and fast or heavy, large and comfortable or luxurious. Carriages normally have suspension using leaf springs, elliptical springs (in the 19th century) or leather strapping. Working vehicles such as the (four-wheeled) wagon and (two-wheeled) cart share important parts of the history of the carriage, as does too the fast (two-wheeled) chariot. A carriage is sometimes called a team, as in "horse and team". A carriage with its horse is a rig. An elegant horse-drawn carriage with its retinue of servants is an equipage. A carriage together with the horses, harness and attendants is a turnout or setout. A procession of carriages is a cavalcade. Some horsecarts found in Celtic graves show hints that their platforms were suspended elastically. Four-wheeled wagons were used in prehistoric Europe, and their form known from excavations suggests that the basic construction techniques of wheel and undercarriage (that survived until the age of the motor car) were established then. First century BC Romans used sprung wagons for overland journeys. It is likely that Roman carriages employed some form of suspension on chains or leather straps, as indicated by carriage parts found in excavations. In the kingdom of the Zhou Dynasty the Warring States were also known to have used carriages as transportation. With the decline of these civilizations these techniques almost disappeared. The medieval carriage was typically a four-wheeled wagon type, with a rounded top ('tilt') similar in appearance to the Conestoga Wagon familiar from the USA. Sharing the traditional form of wheels and undercarriage known since the Bronze Age, it very likely also employed the pivoting fore-axle in continuity from the ancient world. Suspension (on chains) is recorded in visual images and written accounts from the 14th century ('chars branlant' or rocking carriages), and was in widespread use by the 15th century. 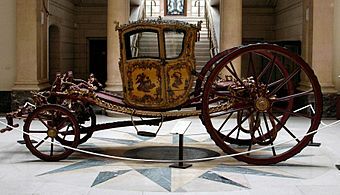 Carriages were largely used by royalty, aristocrats (and especially by women), and could be elaborately decorated and gilded. 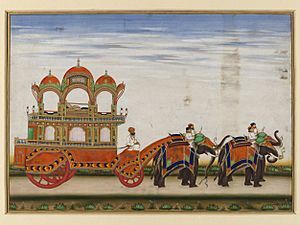 These carriages were on four wheels often and were pulled by two to four horses depending on how they were decorated (elaborate decoration with gold lining made the carriage heavier). 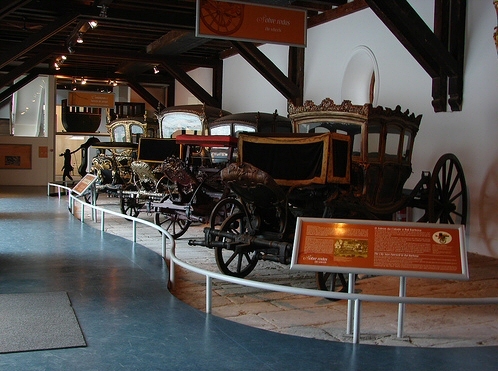 Wood and iron were the primary requirements needed to build a carriage and carriages that were used by non-royalty were covered by plain leather. 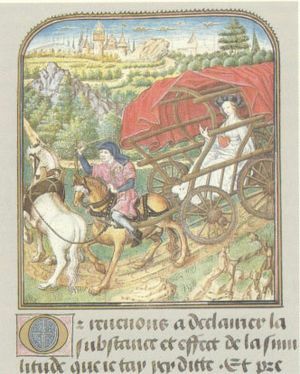 Another form of carriage was the pageant wagon of the 14th century. Historians debate on the structure and size of pageant wagons; however, they are generally miniature house-like structures that rest on four to six wheels depending on the size of the wagon. 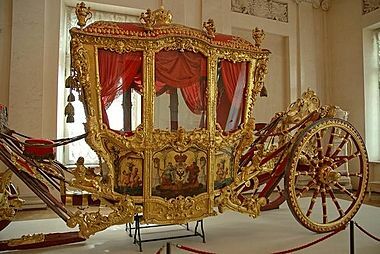 The pageant wagon is significant because up until the 14th century most carriages were on two or 3 wheels; the chariot, rocking carriage, and baby carriage are two examples of carriages which pre-date the pageant wagon. Historians also debate whether or not pageant wagons were built with pivotal axle systems, which allowed the wheels to turn. Whether it was a four- or six-wheel pageant wagon, most historians maintain that pivotal axle systems were implemented on pageant wagons because many roads were often winding with some sharp turns. Six wheel pageant wagons also represent another innovation in carriages; they were one of the first carriages to use multiple pivotal axles. Pivotal axles were used on the front set of wheels and the middle set of wheels. This allowed the horse to move freely and steer the carriage in accordance with the road or path. One of the great innovations of the carriage was the invention of the suspended carriage or the chariot branlant (though whether this was a Roman or medieval innovation remains uncertain). The 'chariot branlant' of medieval illustrations was suspended by chains rather than leather straps as had been believed. Chains provided a smoother ride in the chariot branlant because the compartment no longer rested on the turning axles. In the 15th century, carriages were made lighter and needed only one horse to haul the carriage. This carriage was designed and innovated in Hungary. Both innovations appeared around the same time and historians believe that people began comparing the chariot branlant and the Hungarian light coach. However, the earliest illustrations of the Hungarian 'Kochi-wagon' do not indicate any suspension, and often the use of three horses in harness. Carriages may be enclosed or open, depending on the type. The top cover for the body of a carriage, called the head or hood, is often flexible and designed to be folded back when desired. Such a folding top is called a bellows top or calash. A hoopstick forms a light framing member for this kind of hood. The top, roof or second-story compartment of a closed carriage, especially a diligence, was called an imperial. A closed carriage may have side windows called quarter lights (British) as well as windows in the doors, hence a "glass coach". On the forepart of an open carriage, a screen of wood or leather called a dashboard intercepts water, mud or snow thrown up by the heels of the horses. The dashboard or carriage top sometimes has a projecting sidepiece called a wing (British). A foot iron or footplate may serve as a carriage step. A carriage driver sits on a box or perch, usually elevated and small. When at the front it is known as a dickey box, a term also used for a seat at the back for servants. A footman might use a small platform at the rear called a footboard or a seat called a rumble behind the body. Some carriages have a moveable seat called a jump seat. Some seats had an attached backrest called a lazyback. The shafts of a carriage were called limbers in English dialect. Lancewood, a tough elastic wood of various trees, was often used especially for carriage shafts. A holdback, consisting of an iron catch on the shaft with a looped strap, enables a horse to back or hold back the vehicle. The end of the tongue of a carriage is suspended from the collars of the harness by a bar called the yoke. At the end of a trace, a loop called a cockeye attaches to the carriage. In some carriage types the body is suspended from several leather straps called braces or thoroughbraces, attached to or serving as springs. Beneath the carriage body is the undergear or undercarriage (or simply carriage), consisting of the running gear and chassis. The wheels and axles, in distinction from the body, are the running gear. The wheels revolve upon bearings or a spindle at the ends of a bar or beam called an axle or axletree. Most carriages have either one or two axles. On a four-wheeled vehicle, the forward part of the running gear, or forecarriage, is arranged to permit the front axle to turn independently of the fixed rear axle. In some carriages a 'dropped axle', bent twice at a right angle near the ends, allows a low body with large wheels. A guard called a dirtboard keeps dirt from the axle arm. Several structural members form parts of the chassis supporting the carriage body. The fore axletree and the splinter bar above it (supporting the springs) are united by a piece of wood or metal called a futchel, which forms a socket for the pole that extends from the front axle. For strength and support, a rod called the backstay may extend from either end of the rear axle to the reach, the pole or rod joining the hind axle to the forward bolster above the front axle. A skid called a drag, dragshoe, shoe or skidpan retards the motion of the wheels. A catch or block called a trigger may be used to hold a wheel on a declivity. A horizontal wheel or segment of a wheel called a fifth wheel sometimes forms an extended support to prevent the carriage from tipping; it consists of two parts rotating on each other about the kingbolt above the fore axle and beneath the body. A block of wood called a headblock might be placed between the fifth wheel and the forward spring. Cartela (or "Kartela", a Philippine horse carriage, in art (8 Waves Waterpark & Hotel San Rafael, Bulacan). A man whose business was to drive a carriage was a coachman. A servant in livery called a footman or piquer formerly served in attendance upon a rider or was required to run before his master's carriage to clear the way. An attendant on horseback called an outrider often rode ahead of or next to a carriage. A carriage starter directed the flow of vehicles taking on passengers at the curbside. A hackneyman hired out horses and carriages. When hawking wares, a hawker was often assisted by a carriage. 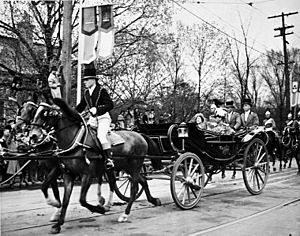 Upper-class people of wealth and social position, those wealthy enough to keep carriages, were referred to as carriage folk or carriage trade. Carriage passengers often used a lap robe as a blanket or similar covering for their legs, lap and feet. A buffalo robe, made from the hide of an American bison dressed with the hair on, was sometimes used as a carriage robe; it was commonly trimmed to rectangular shape and lined on the skin side with fabric. A carriage boot, fur-trimmed for winter wear, was made usually of fabric with a fur or felt lining. A knee boot protected the knees from rain or splatter. A horse especially bred for carriage use by appearance and stylish action is called a carriage horse; one for use on a road is a road horse. One such breed is the Cleveland Bay, uniformly bay in color, of good conformation and strong constitution. Horses were broken in using a bodiless carriage frame called a break or brake. A carriage dog or coach dog is bred for running beside a carriage. 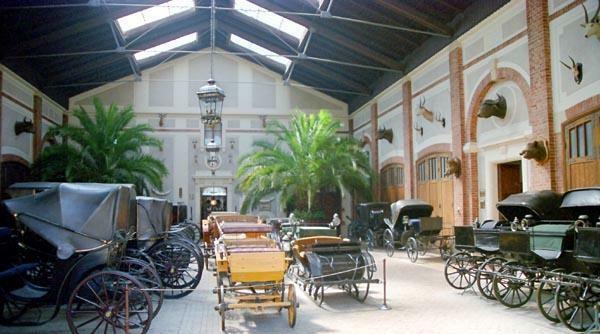 A roofed structure that extends from the entrance of a building over an adjacent driveway and that shelters callers as they get in or out of their vehicles is known as a carriage porch or porte cochere. An outbuilding for a carriage is a coach house, which was often combined with accommodation for a groom or other servants. A livery stable kept horses and usually carriages for hire. A range of stables, usually with carriage houses (remises) and living quarters built around a yard, court or street, is called a mews. A kind of dynamometer called a peirameter indicates the power necessary to haul a carriage over a road or track. In most European and English-speaking countries, driving is a competitive equestrian sport. Many horse shows host driving competitions for a particular style of driving, breed of horse, or type of vehicle. Show vehicles are usually carriages, carts, or buggies and, occasionally, sulkies or wagons. Modern high-technology carriages are made purely for competition by companies such as Bennington Carriages. in England. Terminology varies: the simple, lightweight two- or four-wheeled show vehicle common in many nations is called a "cart" in the USA, but a "carriage" in Australia. Internationally, there is intense competition in the all-round test of driving: combined driving, also known as horse-driving trials, an equestrian discipline regulated by the Fédération Équestre Internationale (International Equestrian Federation) with national organizations representing each member country. World championships are conducted in alternate years, including single-horse, horse pairs and four-in-hand championships. The World Equestrian Games, held at four-year intervals, also includes a four-in-hand competition. For pony drivers, the World Combined Pony Championships are held every two years and include singles, pairs and four-in-hand events. Tourists horse-drawn taxis in Naghsh-i Jahan Square, Esfahan. In Vienna, rentable landaus called Fiacres carry tourists around the old city. Carriage Facts for Kids. Kiddle Encyclopedia.